Oops - we don't appear to have a video for the DR-M140 Limited Edition Black. 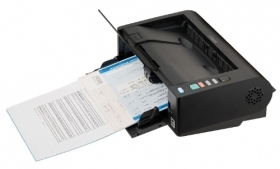 With a robust separation mechanism the DR-M140 reliably scans mixed document sizes and weights together. Ultrasonic double feed detection quickly identifies misfeeds, while a double feed release button lets you ignore and continue' scanning in special cases, such as an envelope or a document with a sticky note attached. High quality image processing The DR-M140 comes with the latest image processing features to help you achieve outstanding quality results every time. Features such as auto colour detection and an auto resolution setting ensure consistently superior image results; while MultiStream accommodates workflows required for improved OCR processing.